This is not the first time our laboratory hosts IEEE 802.11n wireless routers which can operate in two frequency ranges (2.4 and 5 GHz) at the same time. About half a year ago we had already reviewed one model, ASUS RT-N66U. However, today we received a NETGEAR's device, WNDR4500 wireless router, for a thorough inspection. Okay, let's get started. 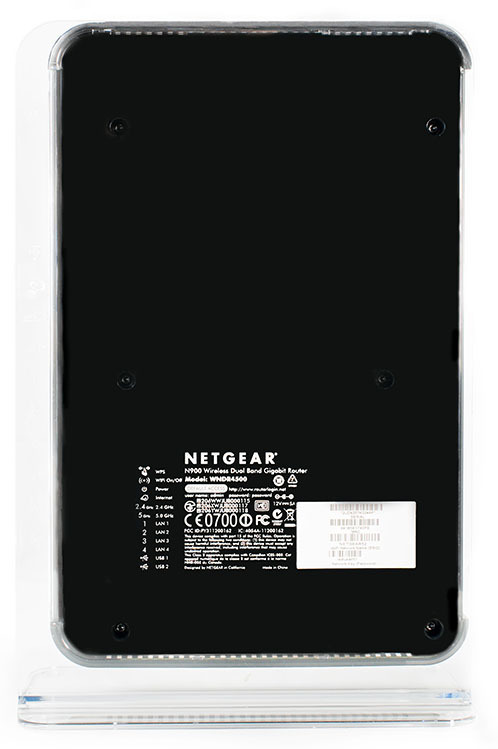 NETGEAR WNDR4500 comes in a black plastic case with rounded corners. One of its outstanding features is a transparent plastic base that holds the device vertically. We think that this feature is a bit odd, but it'd probably be almost impossible to arrange a passive ventilation system inside of the case without it. The device has dimensions of 258x173x81 mm including the non-detachable base. To work properly WNDR4500 needs an external power unit with the following characteristics: 12V and 5A. Side panels of the device are not really remarkable and there are only a 3D brand tag and stickers with brief information about the device located here. It's worth noticing that the case surface is made of glazed plastic and thus it can be easily scratched or get dirty. The front panel there has LEDs indicating the device status, as well that of its user ports, located on it. Moreover, there are also two buttons used to manage wireless connections: ON/OFF button for Wi-Fi transmitter and WPS button used for simplifying connection of wireless devices. On the rear side there are five Gigabit Ethernet ports (one of them is WAN and the rest are LAN), two USB 2.0 ports, sunken Reset button used to reset the user settings, ON/OFF button, and power socket. Now let's have a look at the insides of the case. 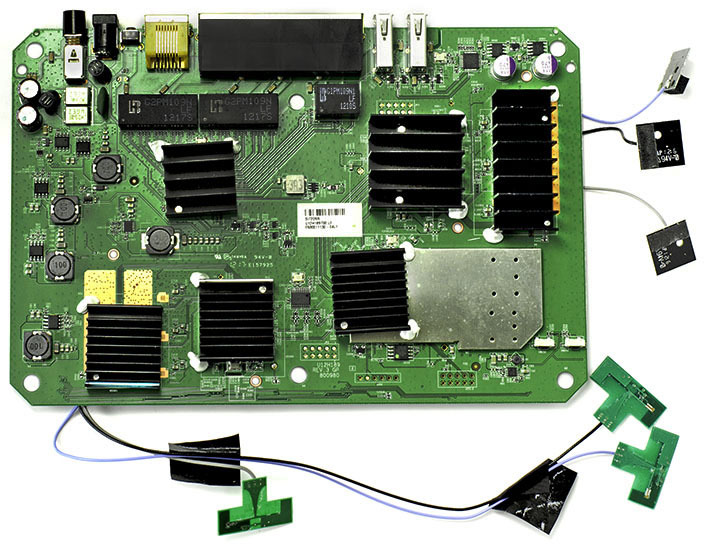 There are seven cards inside of NETGEAR WNDR4500 wireless router: one main card and six internal antennae. The core components are located on either side of the main card, but only Samsung K9F1G08U0D RAM module, with 128 Mbytes of memory, is open to inspection. All other chips are covered either with protection plates or radiators. That is where we bring review of the device hardware to a conclusion and pass on to examining capabilities of its software component. 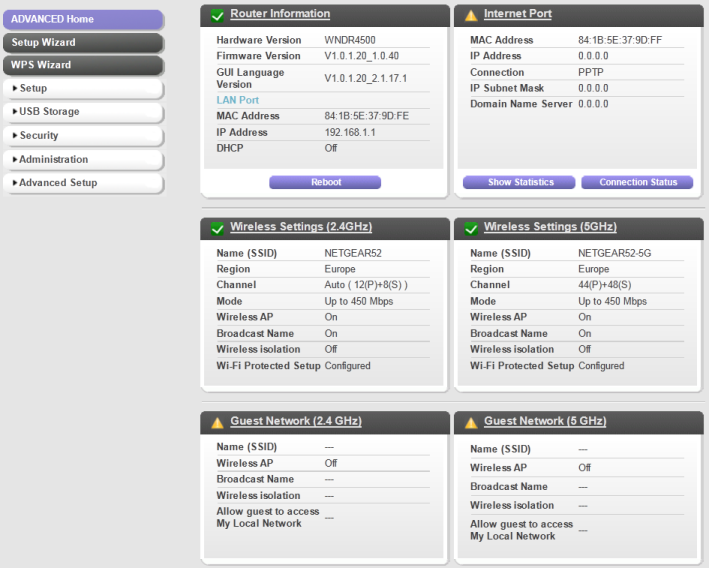 Firmware upgrade is carried out in Router Update sub-group, Administration group of the Advanced mode. There are two methods of upgrading the firmware: a manual mode and semi-automatic one. Firmware upgrade in the semi-automatic mode is available only when WNDR4500 is connected to the WAN network. We would rather review a firmware upgrade procedure in the manual mode. In order to do this an administrator must download the latest firmware version from the official vendor's web-site beforehand. 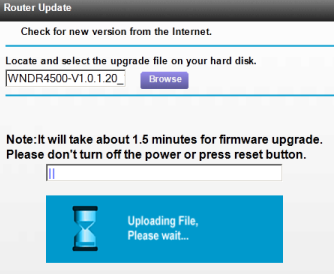 The upgrade procedure doesn't require any technical proficiency from the administrator; one just needs to browse the previously downloaded firmware file and click on Upload button. The device will take care of the rest. The whole process usually takes no longer than two minutes. One can access the web-interface of the NETGEAR WNDR4500 wireless router with any modern browser just by entering 192.168.1.1 IP address. By default the login and password are admin and password, correspondingly. Upon successful authentication the administrator will find him/herself on the home page of the device where from s/he can access and manage the WAN connection parameters, wireless segment settings, browse through the list of connected devices, and customize the parental control policy. The web-interface is available in 23 languages. Also, the administrator can access the help information from any page of the web-interface, the main page included. 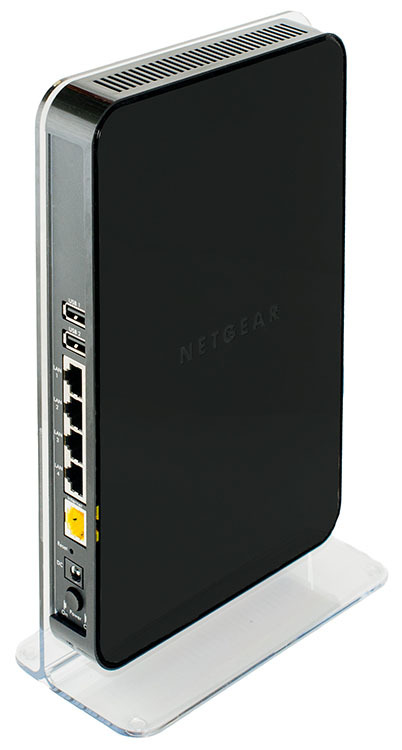 The web-interface of NETGEAR WNDR4500 is available in two set-up modes: basic and advanced. At first let's review those capabilities the basic set-up mode offers. Internet group allows an administrator to detect the WAN connection type used by the provider and in case of a connection failure s/he can use a built-in wizard to configure the connection automatically. Wireless settings are located in the same-named group. By using settings located in this group one can enable and disable isolation of wireless devices independently for each frequency range, specify the encryption type and key phrases, and manage other Wi-Fi parameters. 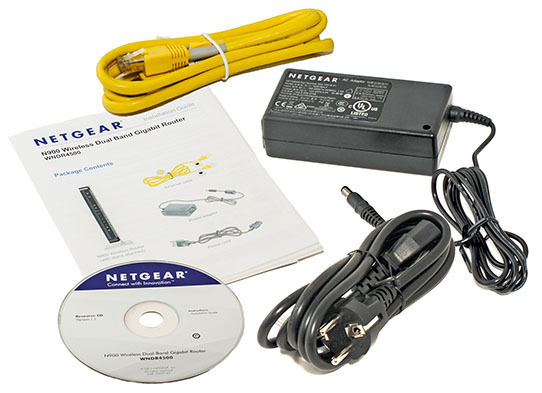 Attached Devices group features a list of wired and wireless clients of WNDR4500. 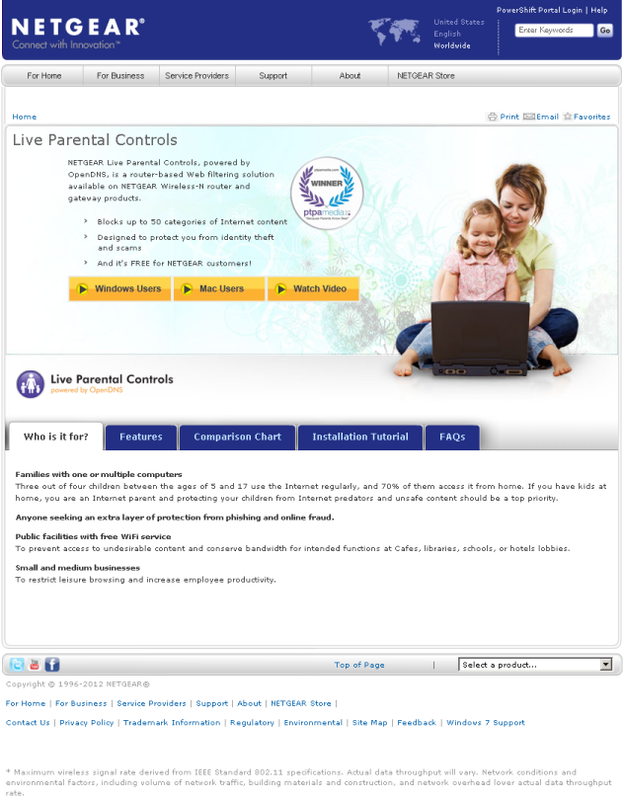 Upon entering Parental Controls group a user is forwarded to the vendor's web-site where s/he can manage parental control parameters from the LAN. ReadySHARE group is used to manage the devices connected by USB. 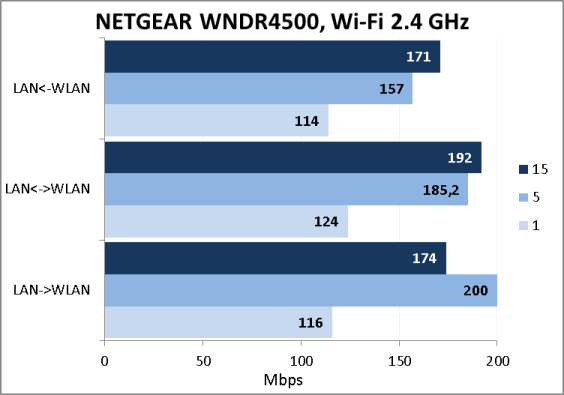 Apart from a common wireless network, WNDR4500 can even create a guest network segment for connection of users or devices that are only granted with Internet access. 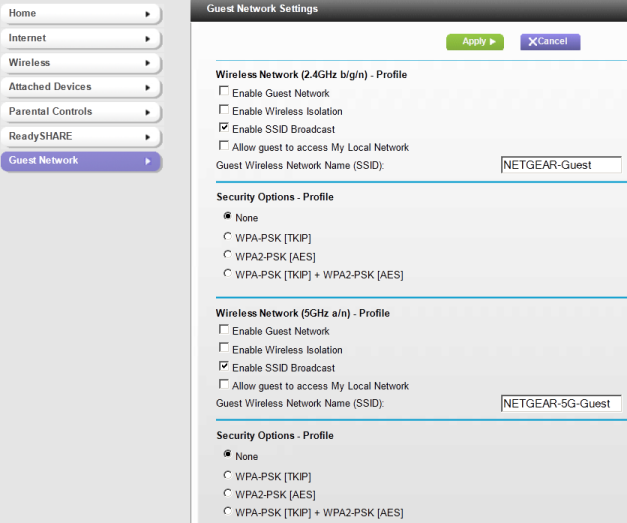 These settings can be applied in Guest Network group. Now let's review some of the advanced mode capabilities. 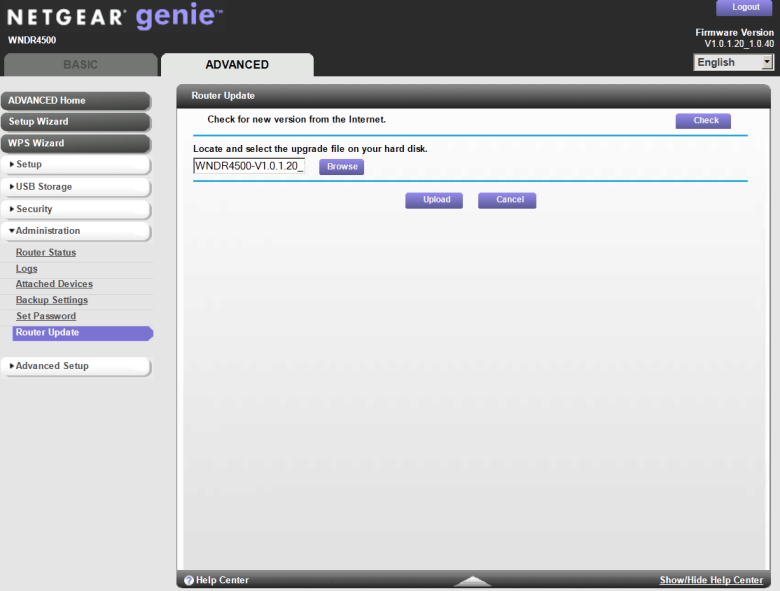 ADVANCED Home page provides an administrator with information on the device, parameters of its Internet-port, and some data on wireless networks. Precisely the same page is located in Router Status sub-group, Administration group. 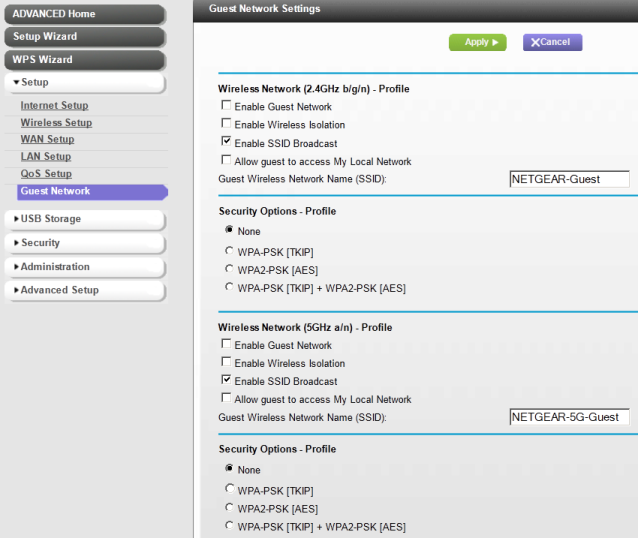 Using Setup Wizard and WPS Wizard one can manage the core WAN connection settings and get the wireless clients connected step-by-step. Setup group contains six sub-groups: Internet Setup, Wireless Setup, WAN Setup, LAN Setup, QoS Setup, and Guest Network; they are used to access secondary parameters of the corresponding networks and manage the service quality settings. A nice addition is an ability to redirect the stream for IP TV to a certain LAN-port. Also, we have been a bit surprised at support of RIP. Management of access to the data stored on connected USB devices is carried out using tabs in USB Storage group. 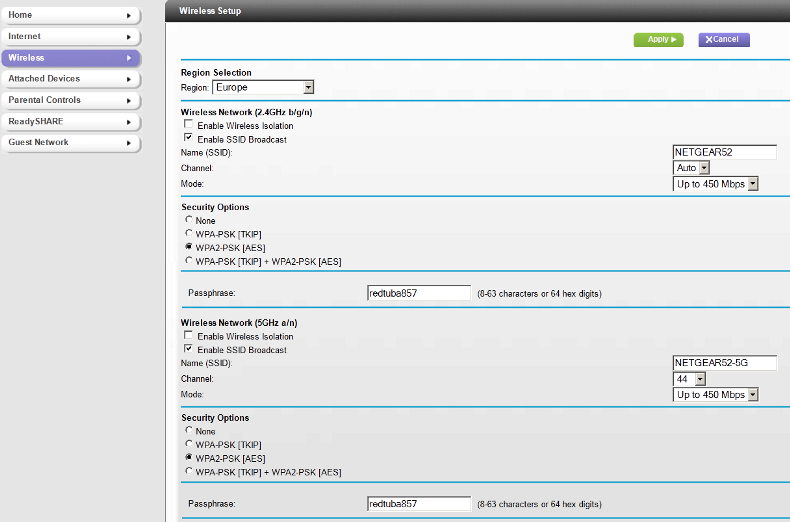 Apart from standard access methods, Samba and DLNA, WNDR wireless router also has support of FTP and HTTP. 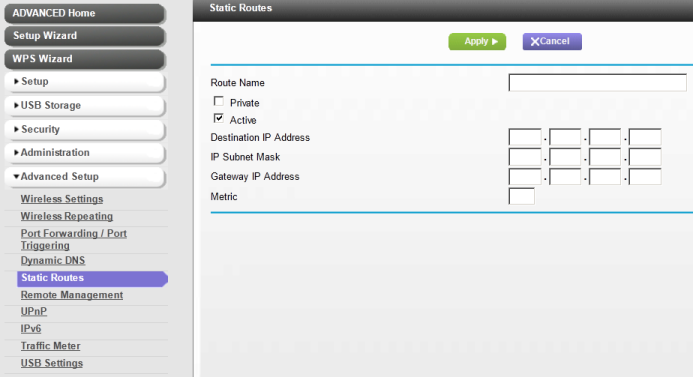 On top of that, the access is available not only from the local network segment of the router itself. Using sub-groups of Security group an administrator can alter parameters of web-site and service blocking, manage parental control policy, schedule the blocking time, and specify the e-mail notifications parameters. We've been left a bit puzzled by the absence of Moscow from the time zone list in Schedule sub-group. By using Logs sub-group, Administration group, one can pick out the event types to be recorded in the log and display previous events. Attached Devices sub-group of the same-named group in the menu is similar to the same sub-group in the basic mode. Using other three sub-groups of this group, Backup Settings, Set Password, and Router Update, one can save/restore/reset the device settings, change the administrator password, and upgrade the current firmware. 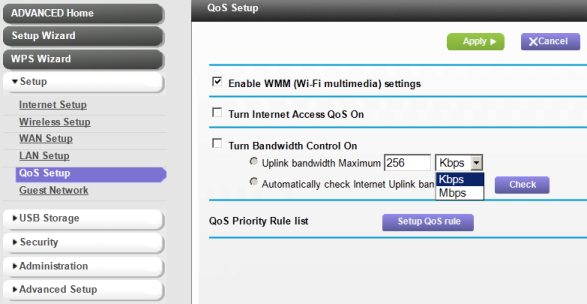 Wireless Settings sub-group, Advanced Setup group, features the same capabilities like those of Wireless Network sub-group in the standard mode. Aside from acting as an access point, the wireless module of WNDR4500 router can perform functions of a repeater; one can manage the corresponding settings in Wireless Repeating sub-group of the same-named group. If in the local network segment of the router there is a certain kind of service which is to be made available for connection from the WAN, an administrator must use Port Forwarding/Port Triggering sub-group. In case the applicable service supports dynamic setting of the router via UPnP, one can turn to the same-named sub-group. 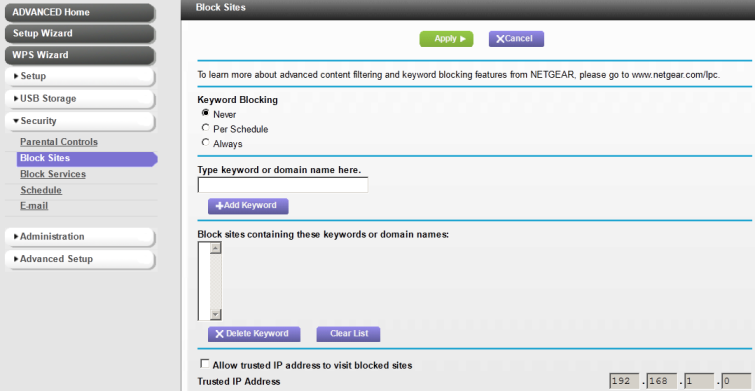 By using Dynamic DNS sub-group an administrator can connect the router to DynDNS.org service. This feature may come in quite useful when the service provider offers users a real dynamic IP address. One needs to use capabilities provided in Static Routes sub-group if it's necessary to set up the static routing. We would like to pinpoint attention of our readers upon Private option that prohibits transfer of a route being created via RIPs. 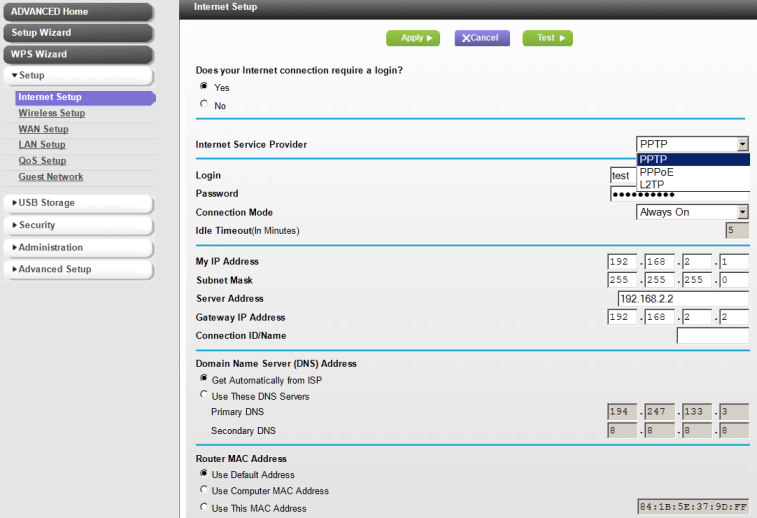 Remote Management is used to specify access parameters to the router settings over the web. NETGEAR WNDR4500 wireless router supports both IPv4 and IPv6 protocols and one needs to use IPv6 sub-group to manage their settings. The wireless router under review can count the traffic used by subscribers in the network. If the traffic cap is reached or exceeded, the device can give out a signal using LEDs located on the front side or even break the connection with the WAN. 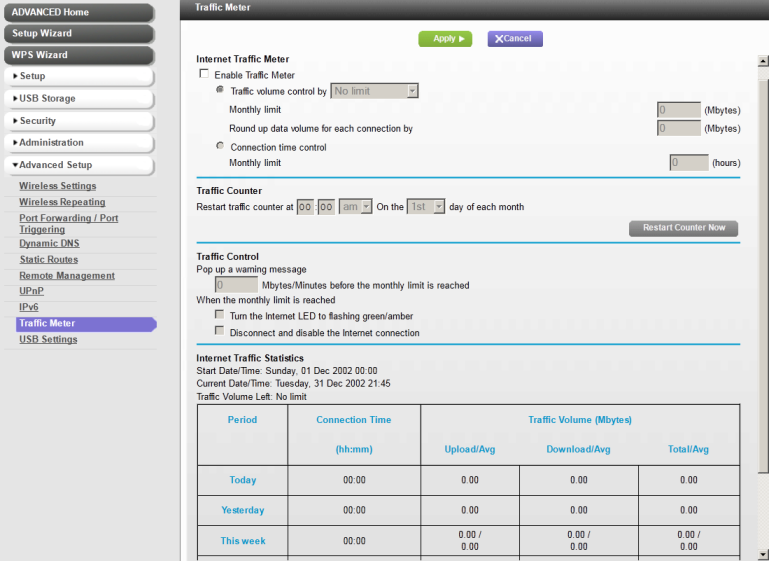 These settings can be applied in Traffic Meter sub-group. Another safety control feature of WNDR4500 is testing of devices connected via USB. 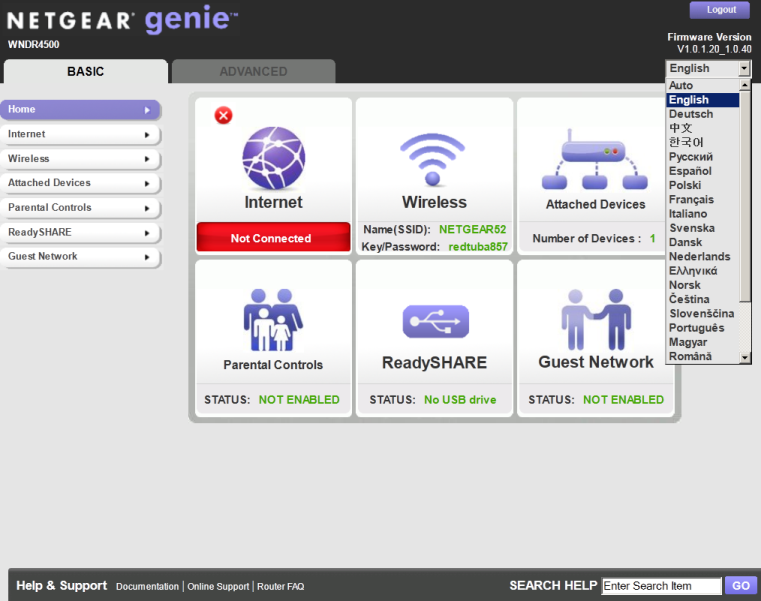 NETGEAR WNDR4500 can keep a list of devices which have been granted access to it. All unauthorized devices are automatically disconnected by the device. That's where we draw the review of the web-interface capabilities of NETGEAR WNDR4500 to an end. The first testing procedure we usually begin our testing section with is estimating the booting time of the device, which is a time interval starting with the moment when the power is on until the first echo reply is received via ICMP protocol. NETGEAR WNDR4500 boots in 49 seconds. We believe that the result is decent. The second test was a traditional security check. 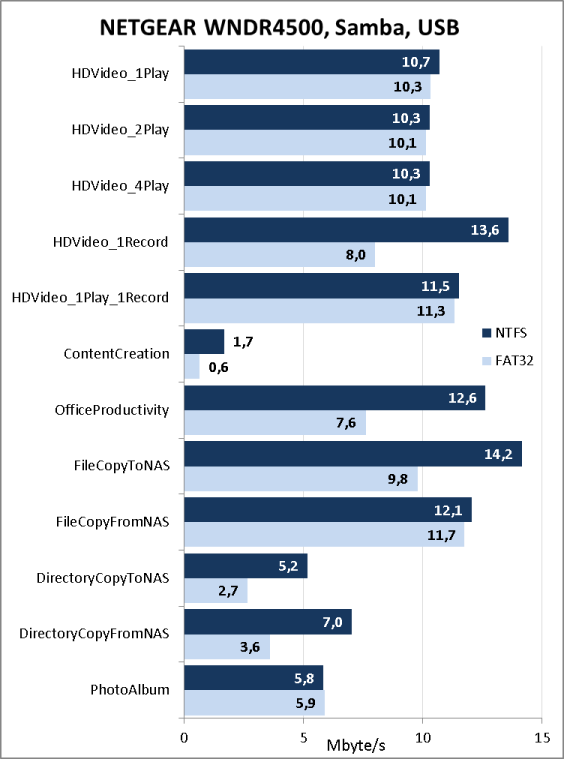 It has been carried out using Positive Technologies XSpider 7.7 (Demo build 3100) utility. On the whole, there were nine open ports discovered, and they are TCP-23 (Telnet), TCP-53 (DNS), TCP-80 (HTTP), TCP-443 (SSL), TCP-548 (afpovertcp), TCP-5000 (Blocked), TCP-8200 (HTTP), TCP-20005 (unknown) and TCP-33344 (unknown). The most interesting data are presented below. We do not think that most of the detected vulnerabilities can be dangerous, except perhaps for the problems with DNS. Finally it's time for testing the device performance. 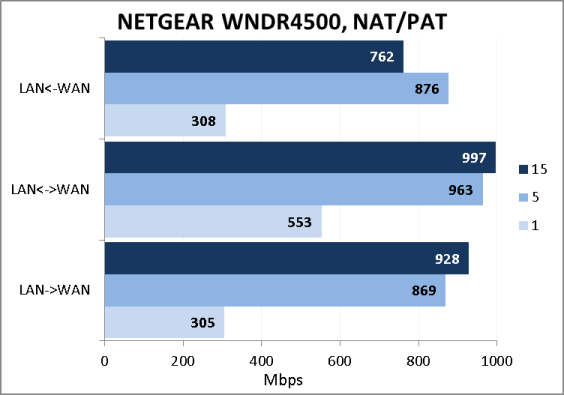 At first we tested performance capabilities of WNDR4500 upon carrying out of a NAT/PAT translation. The test was carried out for 1, 5, and 15 concurrent TCP-sessions. In order to test the device we used JPERF utility, 2.0.2 version. 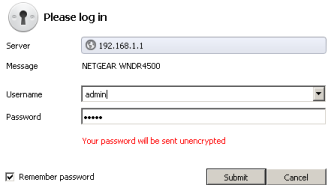 Unfortunately, NETGEAR WNDR4500 wireless router does not have support of encrypted PPTP tunnels. That is why we made performance measurements for PPTP tunnels without encryption. The obtained results are pleasantly surprising. Neither did we keep away from performance tests of the wireless network segment. Since the device under test can operate in two frequency ranges (2.4 and 5 GHz), we drew two diagrams which are presented below. 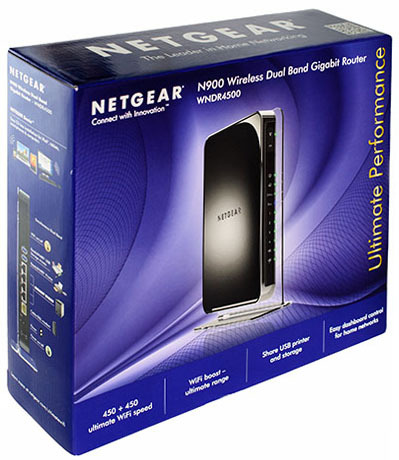 NETGEAR WNDRT4500 wireless router is fitted with a USB port to which we connected a Transcend StoreJet 25M3 external HDD to find out the access speeds to user data located on an external disc with two file systems: FAT32 and NTFS. That's where we draw the testing chapter to an end and move on to summing it all up. 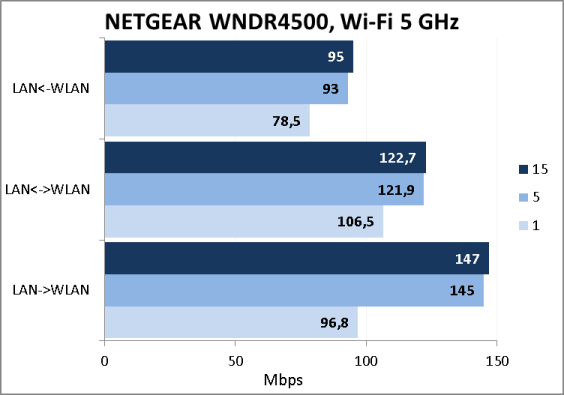 We are glad about NETGEAR WNDR4500 wireless router we tested. 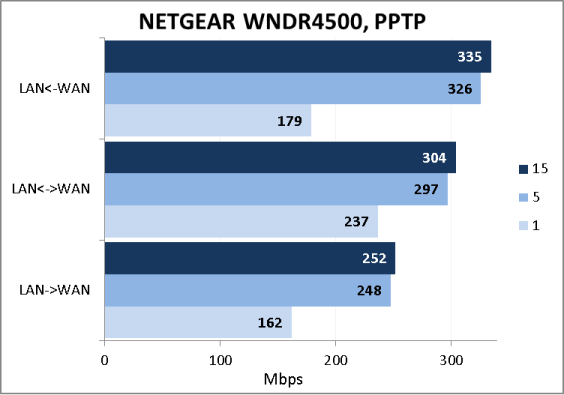 It showed sustainable data transfer speeds both in wired and wireless network segments. But there was one thing which we were really surprised at a lot, and it's the device performance with PPTP. We haven't ever seen such speeds for PPTP tunnelling without encryption on SOHO devices. The strength areas of the device are presented below. Unfortunately, we cannot help to mention a key drawback of the model. As of when this article was being written, the average price for a NETGEAR WNDR4500 in Moscow online shops was 8000 roubles. What exactly has happened to your router?